Brighton Ford : Brighton Ford's Role in Brighton Musical's "Grease"
Brighton Ford's Role in Brighton Musical's "Grease"
BRIGHTON, Mich - When we received the stripped 1951 Cadillac from the students of Brighton High School, we had just a few thoughts. Something along the lines of "why, this car could be systematic, hydromatic, ultramatic. Why, it could be GREASED LIGHTING!" 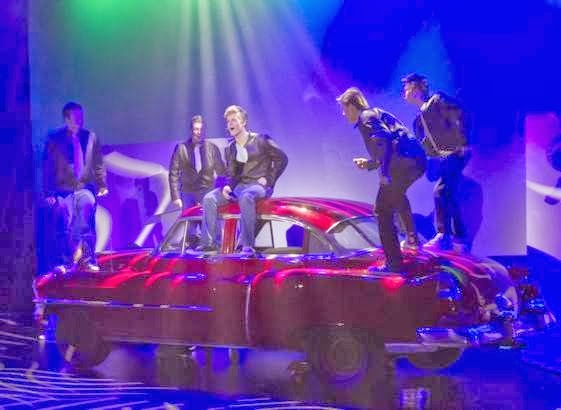 Brighton Ford's Role in Brighton Musical's "Grease" was to help the three Brighton High School students transform an old Cadillac into Danny Zuko's dream car. With a little elbow grease and a few coats of paint, we had the 1951 Cadillac looking better than new and ready the spotlight! Over a few weeks, we painted the car with an eye catching candy-apple-red finish. It was glossed to perfection and returned to the students just in time for rehearsals. We attended one of the seven shows - which all ended up being completely sold out - and couldn't believe how amazing the car looked up on stage. The entire "Grease" performance was terrific, they had the entire audience dancing and singing in their seats. The show really portrayed all of the hard work that was put in by the 105 participating students. We are so proud to have been apart of such a wonderful production and work with the amazing students of Brighton High School. Congratulations on all of your success! To see more photos of the the Greased Lightning transformation, head to our Facebook page and look for the "Greased Lightning" album! You can count on Brighton Ford to take care of all of your vehicle needs. Stop by the dealership and let us take care of you and your vehicle! Brighton Ford is located at 8240 Grand River Ave. just north of I-96 in Brighton. We are a family owned and operated business that strives for customer satisfaction. For more information on Brighton Ford visit BrightonFord.com or give us a call at (800) 836-8206.